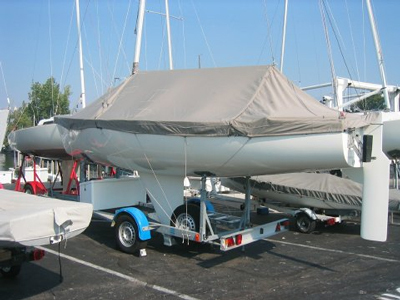 The Sailors' Tailor, Inc... manufacturing and stocking over 170 One Design boat cover since 1972. 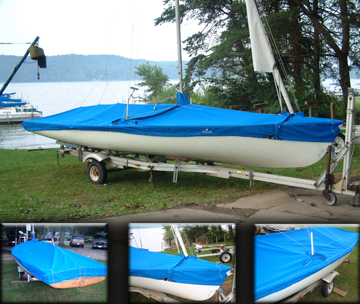 Manufacturing Sailboat Covers for over 170 One Design Classes, Motorboats, and More! For over three decades we have led the way with our unique cover designs. Other cover makers have copied our ideas but have left out the details that give you the long lasting durability you get with THE SAILORS' TAILOR Inc. brand name. Our highly skilled seamstresses spend a lot of time and labor adding details that add years to the life of both our cover and your boat. How do we accomplish this? Read chart below. PTFE Teflon® thread coated with Teflon®, for outstanding chemical and UV resistance which will not be damaged by exposure to sunlight, weather, or water. Designed to last as long as the fabric. Chemically Stripped polyester thread which deteriorates in UV and needs to be restitched every 2 to 3 years. Covers made with Unique Vinyl like double-coated Poly Army Duck Fabric or top quality acrylic materials. Uncoated, or laminated fabric that delaminates. Flat-Felled seams double stitched through 4 layers. Double needle lock stitched flat-felled seams leave no edges to fray and seal water out better than other types of seams. Single or chain stitched through 2 layers. Overlapped cloth seams sewn with a zigzag stitch used by other cover makers allow driving rain to run right through. Double-folded hems stitched through 3 layers. Turned-up hems stitched through 2 layers. Heavy duty nylon zippers don’t scratch the boat. Metal zippers which rust and become difficult to operate over time. The flaps hide and protect chain plates and zippers from water seepage and damaging UV and the snaps hold much better than velcro. Gaping opening or Velcro that quits "sticking" after about one year's exposure to grass, debris, and UV. 5/16” elastic shock cord in the hem AND draw cord tie downs to secure the cover on the boat. Only Tie downs or cotton draw cord to hold the cover on. Tie-down points are soft webbing loops. 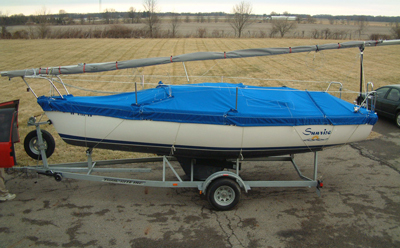 Tie-down points are grommets that scratch the boat. Around the mast we sew a stand-up mast collar with draw cord closure at the top. A split opening that allows rainwater to stream down the mast. Rudder, tiller, mast, and more Bags. Includes: FREE How to Choose the Right One-Design Cover.